Casey: It's such an intimate movie. The only time Amour left its small apartment setting was for a few minutes early in the movie, and that was a static shot of a theater audience. Besides that, we effectively live with the characters for the duration of the film. Most of the scenes are extremely straightforward, even mundane, with Georges simply trying to take care of his wife as best he can as she gradually loses the ability to walk, move, and even speak. It's not a sentimental film--in fact, it's a little bleak--but it's honest and poignant. Brooke: Poignant is an understatement--particularly for those of us who have seen our own family members in the same state Anne was. My grandmother died just over four months ago, after living with the effects of her stroke for a year and a half. I only saw her a time or two after the stroke, but watching Anne struggle as Georges and the nurses tried to feed, bathe, clothe, and move her around the apartment was deeply moving and extremely cathartic for me. Even the title, Amour, is a testament to the simplicity of the film. It's just about love and what that really means after 50 some-odd years. A few friends and family do come through to visit, but they're not part of the movie. It's about Georges and Anne, but mostly Georges, dealing with the overwhelming aftereffects of Anne's stroke. The family tries to persuade Georges to hire more help or do something, but he cares for her and refuses to send her to a facility or hospital. Casey: His refusal is in part because he had promised Anne that he wouldn't. 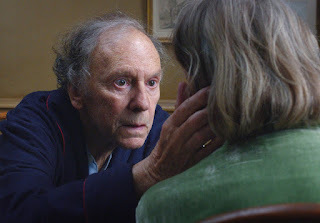 Something I loved about Amour was its understatement in showing Georges struggling to do the right thing. He clearly doesn't resent having to care for Anne, but he admits being out of his depth. He respects her wishes to avoid hospitalization while doing what he can to keep her alive even when she seems to not want to live. He persists in spending time with her even when it isn't clear she knows he's there, and the stress of it clearly weighs on him. And on her. 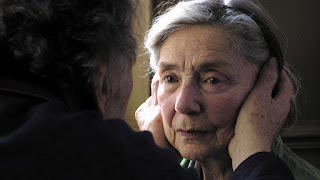 Emmanuelle Riva is fantastic acting the role of a woman struggling to maintain dignity as her body and mind fall apart. Like you, I've lost grandparents and other friends and relatives in the last few years, and we've attended some of the funerals together. In each case we weren't necessarily around when things started to get bad, but our parents and other family members were. Some day we'll probably find ourselves caring for a loved one before they die, or of being cared for ourselves. It's a somber thought, but hopefully the love we've given and shared will help when the time comes. Brooke: I certainly hope we remember to do our part when the time comes. I'm reminded of a conversation we had with one of your friends about his special needs nephew who had died not long before, and how he regretted waiting so long to learn how to help out. While we clearly see that caring for Anne is taxing on Georges' old body, it's a burden he is more than happy to take on. We have no idea just how much time passed between Anne's stroke and her death (not a spoiler, you know she dies from the get-go) but as the film progresses you can see the toll it takes on him. It was hard to see him reject most of the help offered. Of course, if he had accepted help, the tone would have been completely different. This wasn't a movie about everyone and Anne; it was about Georges and Anne. He would do anything for her, she's the love of his life, and in the end, he truly does do everything for her. Casey: Right after the movie ended you said something like, it was beautiful and hard to watch. That about sums it up. Everybody should see Amour, though I wouldn't blame them if they only watch it once. Early in the film Georges tells Anne a story about having seen a movie long ago that made him cry. "I don't remember the film," he says "But I remember the feeling." I suppose that how it will go for Amour, because it evokes feelings, good and bad, from real life that are impossible to forget. Brooke: Anne remarks there that Georges never told her that story before, and he insists that he still has plenty of stories to tell that she hasn't heard. There are so many different stories to tell just in this movie and so many different ways to tell them. You slowly learn a few details of their lives, but what matters most is how they love each other despite the stroke(s) and troubles that come with it. I think that's the take-away: Georges still remembers the feelings.